Be sure to review our guide to preparing for your annual review. If you’re lucky enough to work at one of Silicon Valley’s top companies, you know competition for tech jobs is fierce. 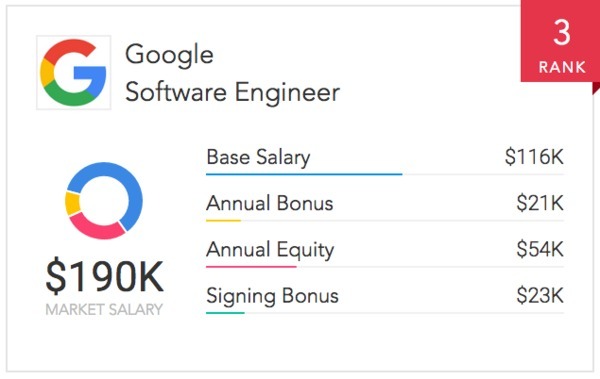 After all, with companies like Google paying software engineers nearly $200,000 in annual salary according to Paysa data, it should be no surprise when top talent from around the world fights for one of these open tech jobs on their team. 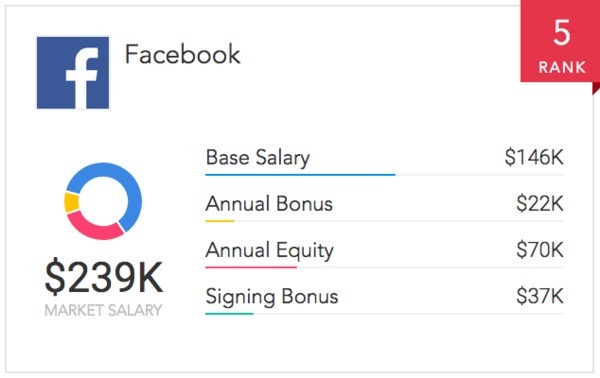 As a result of such healthy demand, current employees at top tech companies need to consistently prove their worth or else risk losing their positions to more capable talent. There’s no better opportunity than your annual review to demonstrate the value you’ve brought to the team over the last year, along with how you plan to continue your path of excellence moving forward. That’s why you need to be prepared. Not just for the review itself, but for the steps to take after your annual review. Whether the feedback is good or bad, this post will help ensure you’re taking the right steps after your annual review. Annual reviews are often a long, stress-inducing process. Molly Graham, former Director of Mobile Strategy at Facebook, shared the social media giant’s annual review process in a 2013 Quora post. Most companies like Facebook don’t provide copies of your review prior to the meeting with your manager. Therefore, you’re likely going into your annual review blind. Sure, you’ll likely have a gut feeling if your performance over the last year was exceptionally good (or, for that matter, exceptionally poor), but for the majority of people in tech jobs, the review itself is a flurry of information with little or no time to digest. That’s why you need to take some time to digest the feedback and put together a plan of action. Making rash decisions during your review — whether it be vehemently defending a critical decision you made on a recent project or demanding a raise — likely won’t go over well with your manager. Thank them for the important feedback and ask to schedule a follow-up. By politely ducking out of the conversation, you’re buying yourself some time but also making it clear to your manager that you want to revisit the conversation. Aim for a 30-minute follow-up meeting a week later. Request a written copy of your review. You’ll likely have a tough time remembering everything that was said, so a written copy will help refresh your memory. Write out your thoughts. This is just for you, not for your manager. Take a few minutes to write out your feelings post-review. Are you nervous, stressed or even angry because it didn’t go as well as expected? Are you excited or nervous because it went well? (A good review can often be equally as stressful.) Write it out while it’s still fresh in your mind. Once you’ve done those three things, move on to Step #2. Regardless of whether your review was spectacular or awful, the next step after your review involves putting together a plan to improve in the upcoming year. Top-performers in tech jobs need to be thinking about how to take their careers to the next level. Poor performers need to be thinking about how to course correct for the upcoming year. How do you create an actionable plan after your review? Based on the feedback you received from your manager and your own self-reflection, think of the big goals you want to set for yourself this year and then break those goals down into milestones throughout the year. Once you have a plan in place, it’s time for the next step. This meeting is where you’ll present your plan to your manager for their sign-off and ask any pertinent follow-up questions. If your review went well and you plan to ask for a raise during this meeting, be sure to check out Paysa.com first. 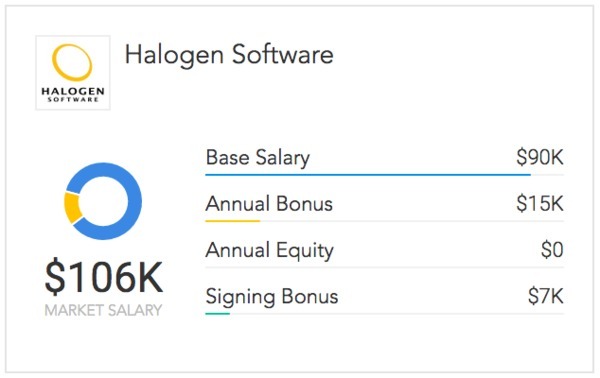 You can plug your current salary information into Paysa’s “Get a Raise” tool and receive a custom report that provides an average market salary for your role. 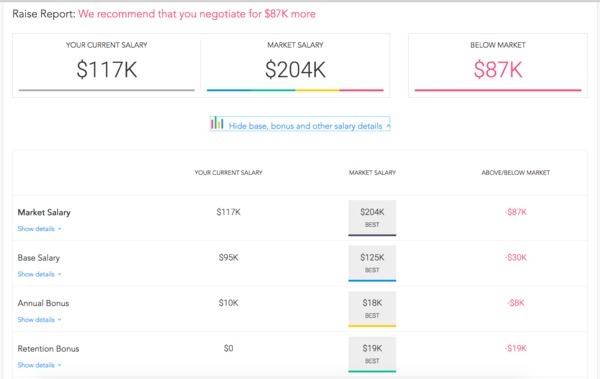 That report can be an incredible tool to leverage during your negotiations. What skill gaps do I need to focus on this year to be a top-performer in my role? What opportunities exist internally to develop those skills? Can we schedule monthly check-ins on goal progress? Once you’ve completed the follow-up meeting and have reached an agreement with your manager on the upcoming year’s action plan, you’re ready for the next step. The goal should be to spend 10-15 minutes twice a week writing down detailed accounts of major work events along with your perspective about how or why the event occurred. Did I allow myself adequate time to reach this milestone? What prep work could I do next time to get better results? What cross-functional partners can I leverage to ensure future success? What do I need to improve on for next week? Get in the habit of sticking to this exercise over a few weeks, then move on to Step #5. Both good and bad reviews alike are opportunities to explore the job market. If you’re on the receiving end of a poor review, keeping an eye out for opportunities is a smart move for obvious reasons: you know your job is potentially at risk. But even beyond exploring opportunities for security purposes, a job search might be the best way to ensure you’re working for a company aligned with your values and goals. For example, if you received a poor review because you didn’t hit a client outreach quota that you feel borders on annoying to clients, ask yourself: do you really want to hit that quota? Or is it time to explore other tech jobs? For those who received positive annual reviews, now is a great time to test your worth in the job market. This is true especially if you’re good review isn’t accompanied by growth – either in compensation, responsibility or both. Exploring new tech jobs after a good review may seem counter-intuitive, but if you’ve plateaued with your current company, it may be time to look elsewhere. Paysa.com should be your go-to source for discovering open opportunities with top tech companies. With thousands of jobs organized by skills, company, title and location, finding a quality opportunity is easy. 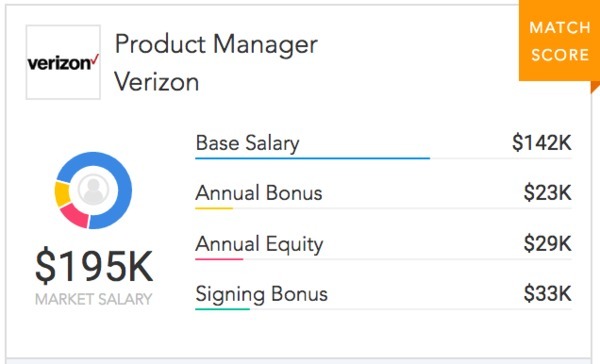 Paysa also includes detailed salary information for all open jobs, like this one for a Product Manager at Verizon. Taking these steps following an annual review – good or bad – ensures you’re on the right path to advance your career in the year to come. Paysa.com is here along the way. Whether you’re using our Raise Reports or exploring new job opportunities, leverage Paysa as your go-to tool after your annual review. Next ArticlePayPal vs. eBay: Who Pays More?